The goal of the expanded core facility is to provide investigators with cutting-edge ultrasound imaging services for quick visualization and sizing of tumors, monitoring and quantifying tumor blood flow, and providing information on the molecular biomarkers of tumor neovasculature (e.g., neuropilin, αvβ3, VEGFR2). This system is also suitable for imaging perfusion in other organs (e.g., heart, muscle and kidney), biomarkers of inflammation (e.g., P- & E-selectin, VCAM-1) and vascular markers of ischemia-reperfusion injury. Ultrasound imaging provides unsurpassed detection sensitivity for microbubble contrast agents: a single microbubble (~1-2 µm in diameter and <1 pg in mass) can be visualized in real time. Due to the rapid clearance of circulating microbubbles from the bloodstream, one imaging session (with one contrast type) takes only ~15 min. Ultrasound studies will be performed in a small operating room inside the MR4 vivarium, and can be scheduled when equipment is available. Isoflurane anesthesia equipment will be available, but investigators can substitute other methods of anesthesia as appropriate. Core personnel will help investigators with the use of ultrasound imaging equipment, as scheduled. A unique feature of this service is the availability of research-grade non-targeted microbubble contrast agents for monitoring tumor vasculature and/or tissue perfusion assessment. Fig. 2 Ultrasound Molecular Imaging of VEGFR2 with scVEGF-decorated microbubbles in a subcutaneous colon adenocarcinoma model. A: grayscale (anatomy) image of tumor mass. B: contrast US image of non-targeted microbubbles after 6-minute dwell time. C: contrast US image of adherent scVEGF-microbubbles. Molecular imaging can also be performed, but requires custom synthesis of microbubble contrast agents decorated with ligands capable of targeting the desired endothelial biomarkers (available for an additional fee). Investigators who are interested in performing such molecular imaging studies are encouraged to contact Dr. Sasha Klibanov to discuss feasibility. The SOM Office of Research Core Administration has generously offered to help subsidize pilot studies utilizing Ultrasound Imaging for an introductory period based on scientific merit and fiscal need. Please contact Dr. Klibanov (sklib1@gmail.com) for details regarding the submission of pilot study proposals to ORCA. 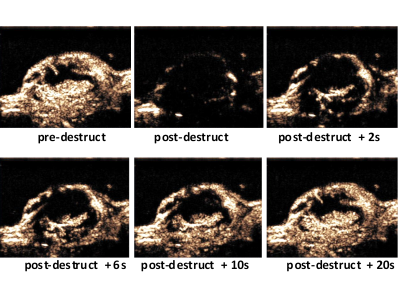 Examples of ultrasound imaging in a subcutaneous murine tumor model include imaging of anatomy (including precise quantification of tumor size), and quantifying tumor perfusion by microbubble contrast influx and destruction, as well as perfusion heterogeneity, presence and size of non-perfused necrotic core (Fig. 1), and imaging respective biomarkers of tumor vasculature (Fig. 2). Fig. 1 Monitoring reperfusion in a subcutaneous colon adenocarcinoma model, following iv contrast administration and a high-MI pulse to remove contrast from the imaging plane, 0, 2, 6, 10, 20s post-destruction.